Wanna stream videos from your iPad or iPhone directly to your Apple TV? Apple’s new iOS features the ability to stream videos to your Apple TV via AirPlay, but only from specific app’s like the YouTube app. Recently Erica Sadun demoed this, showing us how she was able to play videos from her iPad to an Apple TV. 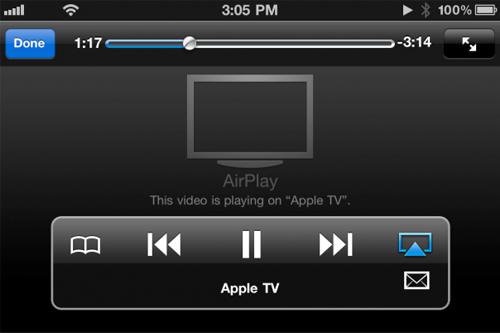 The video shows how you can view any video on your iPad on your HD TV connected to an Air Video server such as the Apple TV. Making this change is as simple as changing one line of code as Erica pointed out. Thankfully you can now download a new app from Cydia called AirVideoEnabler created by Martin Rosinski. After you install the app, it hacks your iPhone iOS to be able to enable video streaming from any app including videos from 3rd party apps, and videos embedded in web pages in Safari. To get AirVideoEnabler you need to have a jailbroken device with Cydia running on it. Then add the following URL as a source to Cydia http://cydia.zone-mr.net and you’ll find the AirVideoEnabler app. Again without this hack, you can only stream videos to your Apple TV from the YouTube app. With this installed on your jailbroken device you can stream content from websites or other apps to your TV via Apple TV. Early reports are that content from Safari plays just fine via the AirVideoEnabler hack, while people are not having too much luck with the 3rd party apps including Netflix, Plex, Klexi, Air Video, Hulu Plus, ABC Player, SkyFire, and Streamtome. Keep in mind that this is a jailbreak app and may or may not work as expected. As always backup prior to any jailbreak install and proceed at your own risk. AppSafari review of AirVideoEnabler was written by Joe Seifi on November 29th, 2010 and categorized under Cydia Apps, Video. Page viewed 9396 times, 1 so far today. Need help on using these apps? Please read the Help Page. hey, I loved this text. Very interesting this content, continue posting more articles like this. Hugs. Wow, I still did not know that, thank you very much for sharing. Very interesting this content! I like it a lot!